We launched the Read North East campaign to the public this week with an exciting event at intu Metrocentre in Gateshead. Nearly 2,000 books were given out to children at the shopping centre on Tuesday 24 October along with activity sheets and family reading tips. The books were donated by Read North East partner Penguin Random House Children’s, home to Puffin and Ladybird. 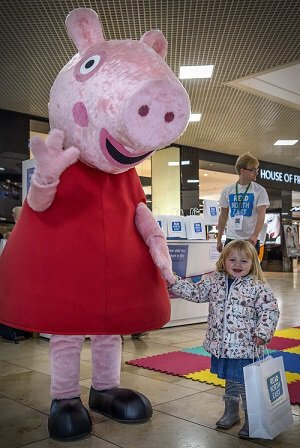 Children also had the chance to meet Peppa Pig and enjoyed storytelling activities throughout the day. Read North East is a campaign from the North East Literacy Forum, which we lead. It encourages parents to talk and read to their babies and children every day to support their literacy skills and give them the best start in life. The book giveaway event was part of a programme of Read North East activities to help raise the region’s literacy levels, which are among the lowest in the country. Our data analysis with Experian found that 60% of wards in the North East are at risk of serious literacy problems, making it the second most vulnerable region to literacy issues in the country. “We are thrilled to be launching our Read North East book giveaway bonanza in Gateshead during the half term holidays. Thanks to the generosity of our partner Penguin Random House, we are putting brand new books in the hands of thousands of children across the region, which we know can have a huge impact on how much they enjoy reading.